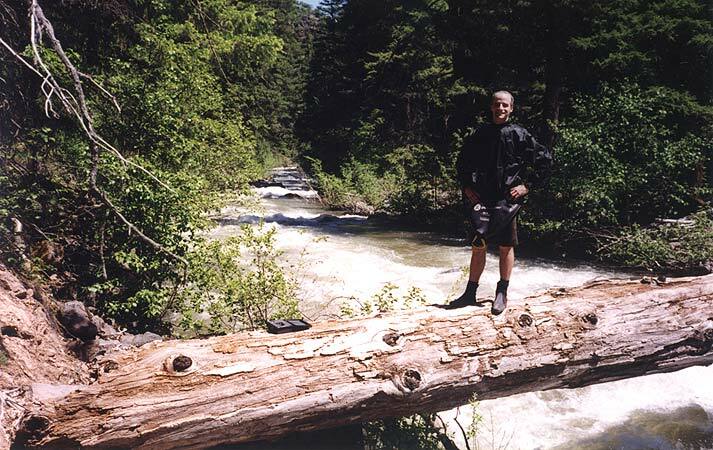 Copyright 2001, Oregon Kayaking. 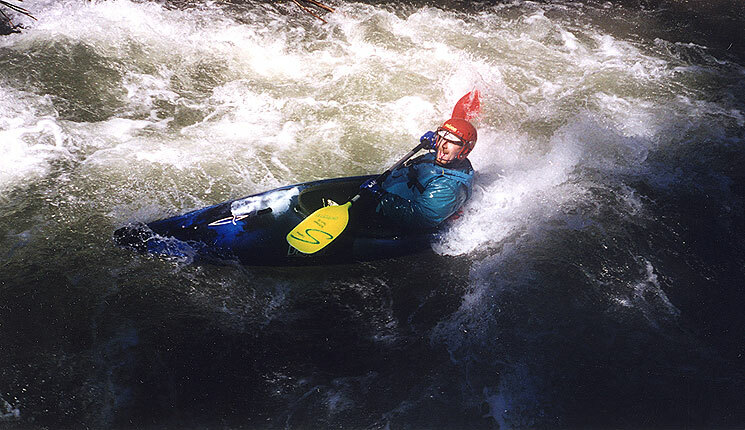 No part of this page may be reproduced, linked, or copied without the express permission of the Oregon Kayaking Webmaster. As I mentioned in the trip report on the lower section of this river, I am a big fan of the White River, especially at the peak of snowmelt in the spring when the river is really ripping. The river comes straight off of the glacier at Mt. Hood, so the water is milky and cold. There is a nice campground at Keeps Mills, very remote, so you can make a weekend of it when you decide to run this section. I have run this section at a variety of flows, but I think a thousand cfs or more is best. Of course, the river changes character at this flow (for the better, in my opinion). Eddies disappear, munchy holes start to form, and the river becomes a single, twelve mile long rapid. Overall the run should only be attempted by class IV paddlers at higher water, and you'd better not be afraid of wood or you won't like this stretch. Lots of folks hike down the first quarter mile and see logs poking out in the river and think the whole river is this way, but it isn't. Of course, at higher water lots of those logs people see get covered up, so you don't have to worry about them too much unless you're out of your boat. This section of the river (like the lower) flows through a deep, rocky canyon, so if you swim and lose your stuff you are going to have a Very Long Day. 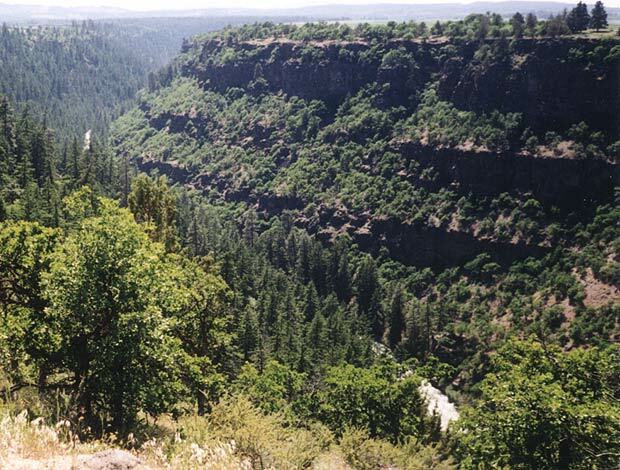 The Upper White River, as viewed from the Canyon wall at the take out. The river is visible in two places in this photo. The first time I ran this river it was between 1000 and 1500 cfs, and we had a blast. The first mile or so is pleasantly steep, somewhere in the 150 fpm range. We were hooting and laughing like little kids as we careened downstream with nothing but whitewater as far as the eye could see. It was great! As we got downstream a mile or so there were some steeper drops we scouted from the bank (boat scouting is impossible at this flow, unless you count 'blindly probing and hoping you don't die' as boatscouting, which I don't.). In retrospect I won't lie and say scouting from the bank was fun though. It was Memorial Day Weekend, so the weather was hot and I was miserably sweaty by the time I got back in my boat. Nevertheless, we were soon tearing down the river again having a great time. When you get up this high on the White the river is almost a uniform thirty feet wide the whole way down. There are no islands, no boulders to speak of in the river itself (at least at higher flows) and no real distinguishing characteristics except the logs, most of which have been there forever so folks use them as landmarks. Lets see. First there is the lunch log, a huge old growth tree that is suspended about six feet above the water. This is where we stop for a snack and some relaxation in the sun. The author on the 'Lunch Log' on the Upper White. There's nothing but fun as far as the eye can see! Then there's the limbo logs, which you have to flip upside down to get under at higher flows, and you can duck under at lower flows. Just remember that there are two of them, both riverwide, and about five feet apart, so hang out for awhile until you are past the second one! My first time down I didn't see the second log (the first log is bigger and blocks the second log from sight). All I could see that there was about a foot of space between the water and the first log, so I flipped and went under the log, neat as can be. Of course, I promptly rolled up only to get clocked in the head by the second riverwide log, which was just downstream! I rolled again (this time involuntarily) and then rolled back up once I was past the second one. Everyone thought it was pretty funny except me! Mike enjoys a long surf on the Upper White. Anyway, the guy was Ok but his paddle remained stuck under the log after he was rescued. Later it popped loose on it's own and that's when Matt and I found it in the eddy downstream. We wanted to return it to it's rightful owner, so Mat tied it to the back of his boat for the remainder of the run. (don't try that at home; you should never tie anything to yourself or your boat under any circumstances!) We ended up running into the folks the paddle belonged to downstream so it was all good in the end. 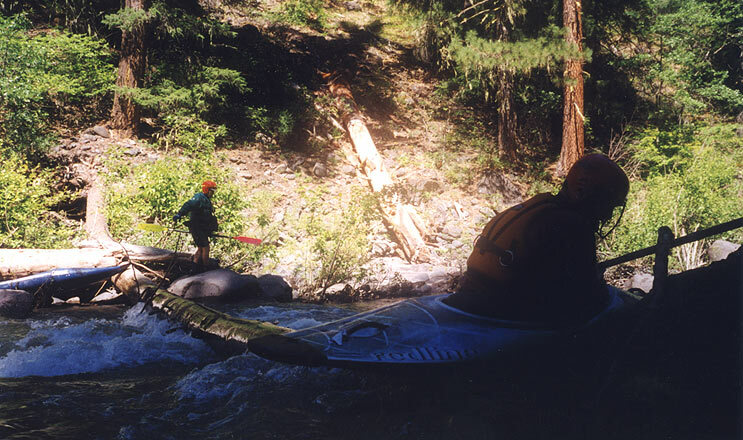 Mike Haley and Tom Powers portage the riverwide log. This photo was taken at lower flows than the others, around 600 cfs. As I mentioned before, at higher flows you can cruise right over this one. A note on flows: In the spring during snowmelt all of the water is coming down from above (or proportionally more) so the gauge readings will understate the actual or equivalent flow because they are so far downstream. This is especially true for the upper section of the White.